The energy bar is made from natural ingredients only, and constitutes a source of available energy for athletes and travelers. The bar is sold in individual packets and in packages of 4 and 12 bars. Date Desert Delicacy a treat based upon the choicest Medjool dates of the Neot Semadar plantations. 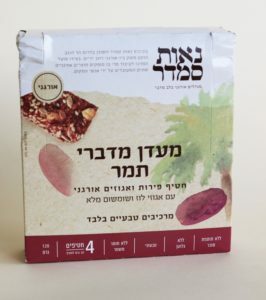 Contains dates and raisins which are rich in iron and nutritional fibers and is seasoned with hazelnuts, sunflower and sesame seeds which are abundant in protein, iron and calcium. 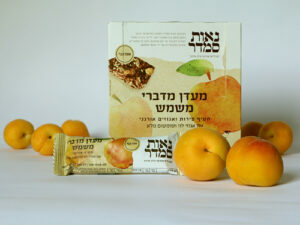 Apricot Desert Delicacy a treat based upon organic apricots, rich in minerals and nutritional fibers, with a garnish of raisins, hazelnuts, sunflower and sesame seeds which are abundant in protein and iron. Sweetened with organic apple concentrate and containing no added sugar. 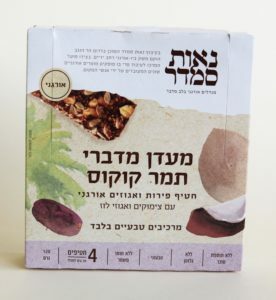 Date-Coconut Desert delicacy a treat based upon the choicest Medjool dates grown in the Neot Semadar plantations. Contains coconuts and organic raisins which are rich in iron and nutritional fibers, and is seasoned with hazelnuts and sunflower seeds which are abundant in protein, iron and calcium. 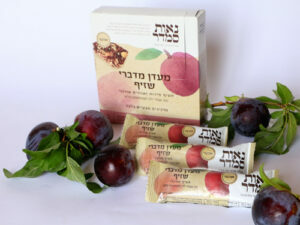 Plum Desert Delicacy a treat based upon organic plum of the choice Metli strain, rich in natural antioxidants and nutritional fibers, with hazelnuts, sunflower seeds and sesame seeds which are abundant in protein, iron and calcium. Sweetened with organic apple concentrate, and containing no added sugar.